“In a temperate and excellent message the President has vetoed the Chinese bill. He states in detail the existing treaty relations between the countries, and the express understanding between the Commissioners upon both sides in the late negotiations. It was stipulated that the free immigration of Chinese should not be prohibited, and that any regulation of their coming should be reasonable. But an exclusion of twenty years is a practical prohibition, and therefore unreasonable. The President adopts this view, and regarding the twenty years clause as a breach of the national faith, he returns the bill. He objects, also, incidentally, to the passport and registration provisions, as subjecting the resident Chinese to needless annoyance, which is equally forbidden by good faith. The President adds further that the bill is repugnant to good policy. It would be detrimental to the general interest to destroy amicable relations with Asia until it is plainly evident that Asiatic competition threatens our labor and safety. To ascertain how far this is probable, a shorter exclusion is desirable. But the President accepts the bill as evidence that Congress is of opinion that the Chinese immigration does injuriously affect our interests and endangers good order, and the tone of the message implies that a “reasonable” exclusion bill would not be vetoed. The possible party effect of his veto the President has properly not allowed to sway his decision. If the veto should give California and the Pacific coast to the Democrats, it would be evident that they could be retained for the Republicans only by a wanton defiance of the American principle that honest immigrants to this country shall not be excluded until self-defense demands exclusion, and that in any case the national good faith shall be preserved. 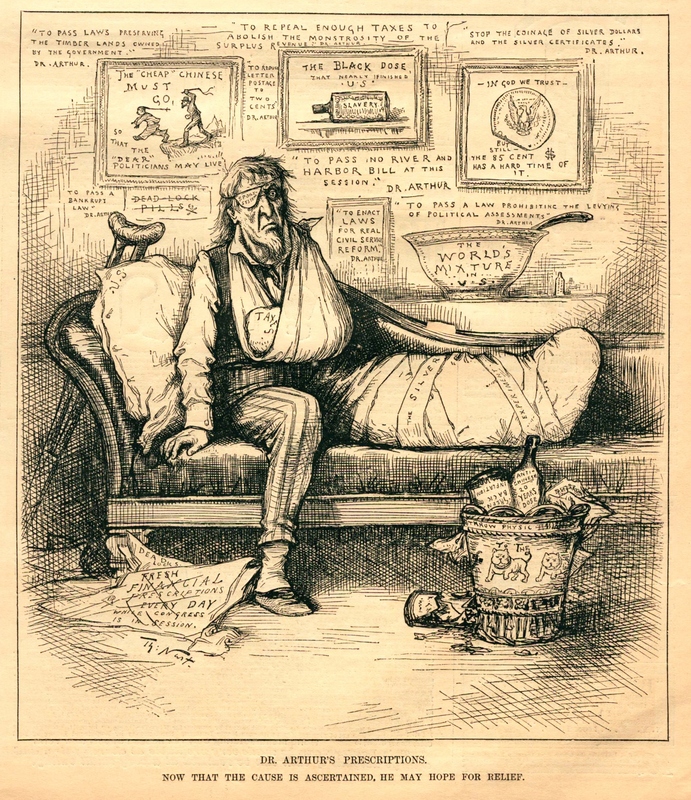 If fidelity to these principles should cost the Republican party [sic] some advantages, that fidelity will ultimately, as usual, commend the party to the renewed confidence of the country.” Harper’s Weekly, 15 April, 1882. Harper’s confidence in Arthur was misplaced. The president signed a revision of the act in May, with a 10-year ban on Chinese immigration. He would soon extend the ban permanently. 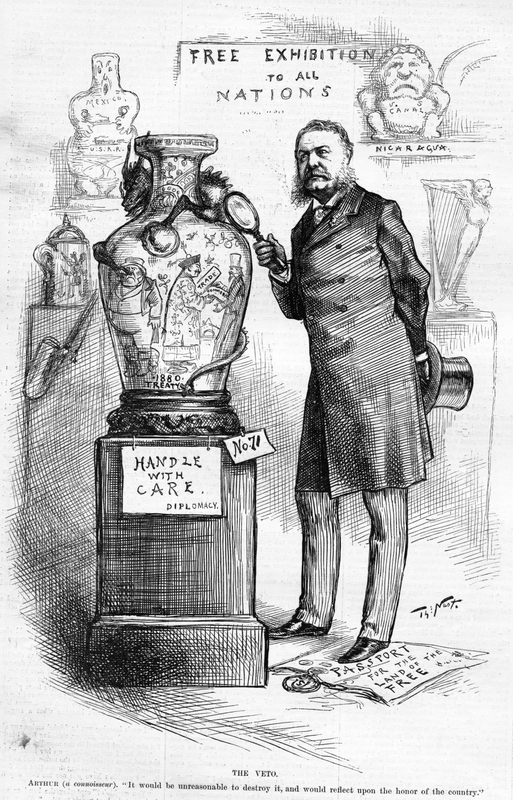 The vase that President Arthur is set to examine with a magnifying glass resembles an earlier cracked vase featured prominently in Nast’s 1881 cartoon, “A Diplomatic (Chinese) Design Presented to the U.S.” The same dragon clings to the top of the vase, but it is less commanding than its appearance in 1881. The vase is labeled “1880 Treaty” and it sits upon a pedestal with a sign that reads “Handle With Care.” The 1880 treaty, though it restricted Chinese immigration, did not interrupt trade between China and the United States. A Chinese diplomat and American are seen exchanging “Trade” and “Commerce” while a befuddled Irishman stares blankly into space.